Heal and restore dull and dehydrated skin with this brilliant product combination. Recommended for all skin types – our original cult product, loved by beauty editors and bloggers the world over. Cleanse your skin beautifully and thoroughly without it feeling dry and tight. Made from 100% natural plant oils with an uplifting rose geranium and chamomile fragrance, our Rose Geranium and Apricot Cleansing Oil is lightweight and gentle and has a lovely easy slip on the skin. Made with nourishing apricot oil and jojoba, it’s brilliant at whisking away all traces of the day, including grime, environmental toxins, sunscreen and makeup. It thoroughly cleanses without stripping, and respects and protects your skin’s mantle. Used as part of the Votary 3 step routine, it gives you clean, happy, hydrated, glowing skin. The ritual: Put 4 to 5 pumps of oil into the palm of your hand. Spread between your palms and then apply to your face. Start with your cheeks, then your nose, mouth and jawline and finally the area around your eyes. Splash your face with warm water and continue to massage the oil into your face and eyelashes. Now here’s the absolutely crucial part. Take a clean flannel. Soak it in hand-hot water, wring it out, and put it over your face. Breathe in and allow the steam to penetrate your pores. Then, gently wipe everything away. Repeat if necessary. To finish, splash your face with warm water and pat dry with a clean towel. Follow this with VOTARY Lemon and Neroli Toning Serum and a VOTARY Facial Oil. Watch Arabella demonstrate the effectiveness of our Rose Geranium and Apricot Cleansing Oil here. This is the ultimate soother. It fixes any dryness or tautness and leaves your skin gorgeously plumped and baby-soft. Rich in avocado oil and apricot oil for supreme nourishment, it provides brilliant protection, especially if skin is seasonally fragile. Calendula flower extract soothes and calms, while rose maroc and sandalwood essential oils provide an aromatherapeutic lift. How to apply: Put four to five drops onto your palms. Hold your palms to your face and take a moment to inhale the natural fragrance and let it settle your mind. Now smooth the oil onto your face and neckline using gentle upward motions. Use your fingertips to gently pat the oil into the area around your eyes. Be gentle with your skin – don’t pull or stretch – so that it retains its elasticity. Allow a moment for absorption, and now your skin is perfectly prepped for sleep. 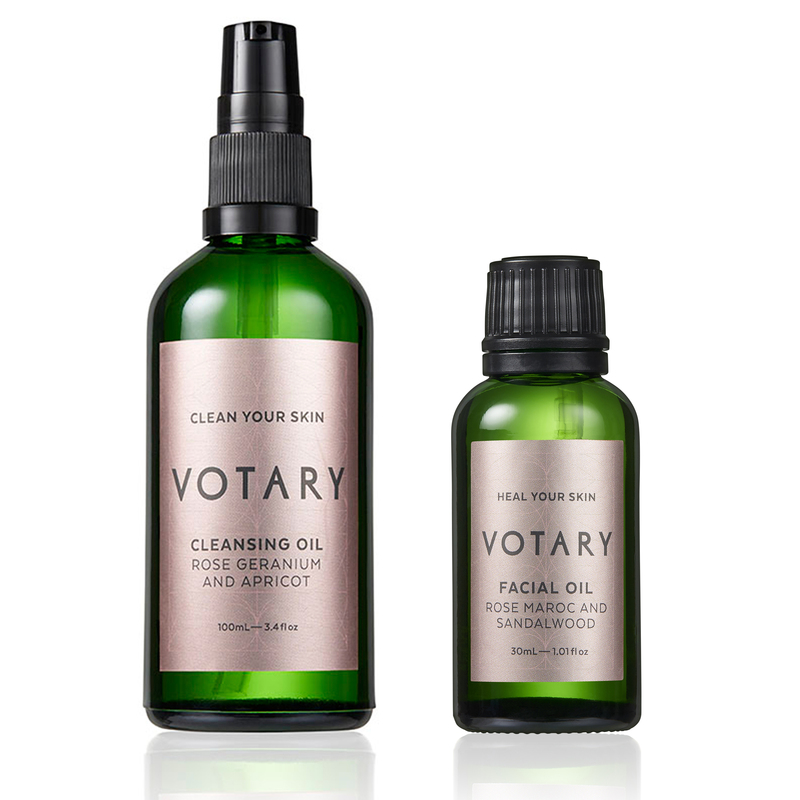 Use this at night after VOTARY Rose Geranium and Apricot Cleansing Oil and VOTARY Lemon and Neroli Toning Serum. Facial massage is the best way to relax and firm your muscles, boost circulation and increase blood and oxygen to the face, watch Arabella’s facial massage technique in the video below. vitis vinifera (grape) seed oil, helianthus annuus (sunflower) seed oil, prunus armeniaca (apricot) kernel oil, persea gratissima (avocado) oil, tocopherol calendula officinalis (calendula) flower extract, santalum spicatum (sandalwood) oil, pelargonium graveolens (rose geranium) flower oil, dalbergia (rosewood) Rosa centifolia (rose) flower oil, geraniol+, linalool+, citral+, citronellol+, limonene+, farnesol+.